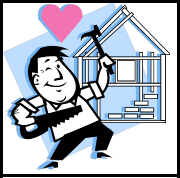 February is Valentine’s month, so why not give your house a little love? Protect and maintain your investment with these easy & inexpensive maintenance tips, and get a head start on your spring cleaning too! CLEAN REFRIGERATOR COILS. Located on the bottom front or back of the refrigerator, clean coils keep the unit running efficiently. While you’re at it, clean the top and underneath the fridge to jumpstart to your spring cleaning! HVAC FILTERS. Filters should be cleaned or replaced monthly. Disposable (cardboard) filters can be thrown away and replaced with new; reusable filters can be cleaned, dried, and replaced. Regular maintenance will lower utility bills, improve system productivity, and keep dust, allerens, & bacteria out of the air you breathe. CLEAN DRYER VENT. Unplug your dryer and scoot it away from the wall to access the vent. Clean the vent and flexible hose (a shop vac works great). While you’re there you might as well clean underneath the dryer–maybe you’ll find all those socks you’ve lost! The exterior vent should be kept clean and lint-free as well. CLEAR DRAINS. Shake 1-2 Tbsp of baking soda into each drain, then pour 1/4 cup white vinegar on top. Let stand for 30 minutes, then pour hot water down drain to rinse it clean. CLEAN CARPETS. Occasionally your carpets will need a deep cleaning. A professional cleaning can extend the life of your carpet, remove dirt and allergens, and freshen the look of your whole house. If you’re in the Tri-Cities, we recommend Pur Clean for fantastic professional cleaning. CHECK SMOKE DETECTORS. Check each smoke detector and have a plan to replace batteries regularly (Daylight Savings time works well for biannual checks). Keep batteries on hand for easy replacement when you hear the high-pitched chirp that signals a low battery! CAULKING. Check caulking inside and out. Exterior–recaulk along windows and doors as needed using exterior caulking. If you can’t match the color of your house or trim, make sure you get paintable caulking. Interior–check caulking along windows, bathtubs, showers, and toilets. Cracked or discolored caulking can be scraped off and reapplied for a clean look and improved seal. These easy maintenace chores will keep your home safer, cleaner, protected, running more efficiently, and ready to sell when the time is right. Homes that are properly maintained are more desirable to buyers. Give us a call for more information on keeping your home maintained or to prepare it for sale.